What is the biggest number you can think of? Or better yet, what is the biggest number you can’t think of? Graham’s number is a quantity so mind-bogglingly large that if you tried to think of it, your head would quite literally turn into a black hole. The maximum amount of entropy you can store in your brain is related to a black hole with the same radius as your brain, and the entropy of this black hole carries less information than it would take to store Graham’s number in your head. The number is so large that the entire observable universe would not be able to store it, even if each digit was the size of a planck volume, the smallest measurable space. Graham’s number is a truly godly value, but where does it come from and why do we need to know about it? Come with me as we journey to the fringes of infinity as we explore one of the biggest number ever used constructively, Graham’s number. 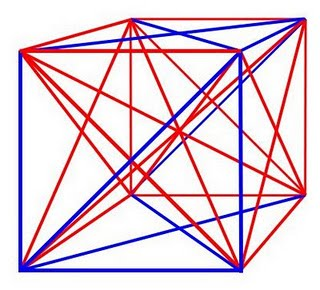 Let N be the smallest dimension n of a hypercube such that if the lines joining all pairs of corners are two-colored for any n≥N, a complete graph K4 of one color with coplanar vertices will be forced. Consider every possible committee from some number of people n and enumerating every pair of committees. Now assign each pair of committees to one of two groups, and find N*, the smallest n that will guarantee that there are four committees in which all pairs fall in the same group and all the people belong to an even number of committees. In a rather complex proof, Ronald Graham, an American mathematician, proved that the answer to this question is somewhere between 6 and Graham’s number. As you can see, adding just one arrow escalates things dramatically. However, 7.6 trillion is a number we can still fathom. It’s about equal to the number of bacteria on eight human bodies. When you add just one more arrow, the numbers become quite literally out of this world. Naturally, g3 has g2 number of arrows, and so on and so forth. Onwards we go until we hit g64, which has g63 number of arrows. Finally, you’re done! Graham’s number is g64. For a long time, Graham’s number was the largest number ever used in a mathematical proof. Nowadays, tree algorithms have produced bigger numbers, including the titanic TREE(3), but Graham’s number will always have a place in mathematical lore. For most of us, numbers this big will have no impact on our lives, but in our most philosophical moments, as we ponder the universe and what is beyond, we can remember that everything in existence cannot hold such a big value, and this colossal number is infinitely smaller than an infinite amount of numbers. Eternity is quite a lot bigger than you might think. Gardner, Martin (November 1977). "Mathematical Games"
Padilla, Tony; Parker, Matt. "Graham's Number". Numberphile. Brady Haran.